Microsoft says that IE8 is more secure, allows users to cut down on common tasks and will be an integral part of its forthcoming Windows 7 system. Although IE is still the most popular browser, it faces stiff competition from Google, Firefox, Opera and others. 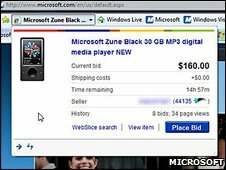 The release is Microsoft's first major browser update since 2006, when the company released Internet Explorer 7. "Customers have made clear what they want in a Web browser - safety, speed and greater ease of use," said Microsoft boss, Steve Ballmer. "With Internet Explorer 8, we are delivering a browser that gets people to the information they need, fast, and provides protection that no other browser can match." Speaking to the BBC, Chris Green - the former editor of IT Pro - said that despite the "marketing puff" the new version of Internet Explorer was a significant improvement on previous editions. "I've been using Internet Explorer 8 for more than six months and is vastly better than IE7, which was big on features but poor on performance. "The safety features in IE8 are very good. It can spot dubious websites and alert you if you're about to fall foul of, let's say, a phishing website, because it has a constantly updating list of dodgy sites." Microsoft has also introduced a feature that it is calling "accelerators" which, say the company, make it easier to perform web-related tasks directly from the page by simply right-clicking a word or phrase. Computer Active's deputy editor, Tom Royal, told the BBC that it was refreshing to see Microsoft pioneer features in a web browser rather than playing catch-up. "The accelerated menu is something no other browser has. 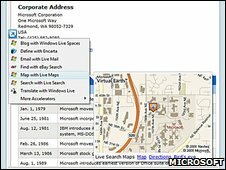 "The contextual popup menus are a real step forward - for example, highlighting and right-clicking on a postcode automatically brings up Google maps. "This has real potential and will make surfing the web much easier. I'm sure others will follow up with something similar," he added. Microsoft has also taken a leaf out of Mozilla's book when it comes to searching. While Firefox allows users to switch between sites like Amazon and Wikipedia, IE takes this a step further, displaying a preview of suggested searches and results appearing in a drop-down list. The new browser can also follow news headlines and track eBay auctions, weather forecasts and blog posts with a feature the company is calling Web Slice, which is, essentially, a news ticker on the favourites bar. Microsoft's share in the web-browser market has been steadily declining and it remains to be seen whether IE8 can reverse that trend. "A browser is still a very personal choice," said Mr Royal. "Some people like theirs simple and fast, while others want stuff with loads of features. IE has always been all things to all people but the perception is that it's the browser that's just there rather than the one you would choose to use. "For now, I would avoid using the new version not because it isn't any good, it's that there are usually lots of undiscovered bugs and security flaws on any piece of new software," he added.